Eating fats makes you fat, right?? Well no actually, wrong!! It’s not actually that simplistic. For years nutritionists, doctors etc. have preached that the key to losing weight, managing cholesterol and maintaining your health was to eat a low-fat diet. We see the same products everywhere – low fat drinks, fat free yoghurt, reduced fat biscuits and so on. Since this low-fat ‘revolution’ began over 20 years ago obesity levels in the U.S. has doubled. Here at home a recent study has shown that 66% of Irish men over the age of 20 are either overweight or obese and 50.9% of women over 20 are in the same category. Maybe these ‘low-fat’ diets aren’t all they are cracked up to be. Trans fat (or hydrogenated oils) are the reason ‘fats’ have such a bad name. These are fats that you want to avoid as they increase your risk of certain diseases and elevate cholesterol. Trans fat are used in the manufacture of foods to help keep them stay fresh for longer. Foods like pizzas, cookies, doughnuts, muffins etc. contain high levels of trans fats (I hear you, all the nice stuff J). Saturated fats have been the topic of a lot of debate recently. For years it was believed that diets high in saturated fat led to increased risk of heart disease and stroke as well as raised blood cholesterol levels. More recent studies have been conducted that discount this theory but as a general rule to following we should reduce the amount of saturated fat we eat. This includes beef, pork, lamb, butter, cheese, ice-cream etc. This is a type of fat found in a variety of foods and oils. Studies show that eating foods rich in monounsaturated fats improves blood cholesterol levels, which can decrease your risk of heart disease. Research also shows that these types of fats may benefit insulin levels and blood sugar control, which can be especially helpful if you have type 2 diabetes. Examples include nuts, avocado and olive oil. This is a type of fat found mostly in plant-based foods and oils. Evidence shows that eating foods rich in polyunsaturated fats improves blood cholesterol levels, which can decrease your risk of heart disease. Polyunsaturates may also help decrease the risk of type 2 diabetes. Examples include omega 3’s found in oily fish, walnuts and sesame seeds. Everybody’s Fats requirements will differ so it wouldn’t be right to put a guideline as to how much fat you should be eating. Follow these simple rules and you won’t go far wrong. · Try to minimise Trans fat in your diet. · Reduce the amount of Saturated Fat in your diet. 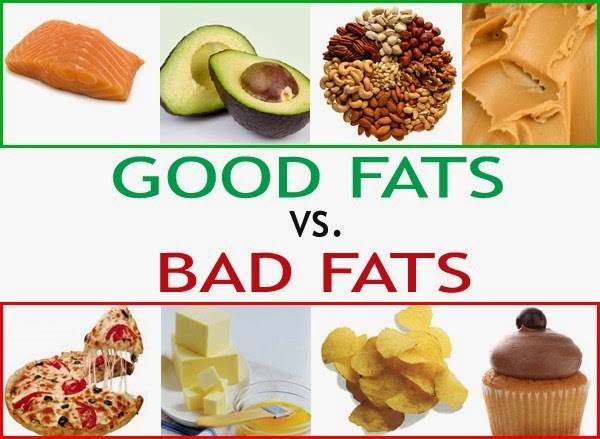 · Replace these Fats with healthy sources of Polyunsaturated and monounsaturated fat. · Do not overdo it on healthy fats as a gram of fat contains 9 kcals (in comparison to a gram of protein = 4 kcals or a gram of carbohydrates = 4 kcals. Replace the unhealthy fats in your diet with healthy ones, don’t add them to it.